Yes the festive season is upon us and the time for decorating our homes in time for the big day. This year though I find I’m having a problem, I say this year, apparently the rest of the family think the big box of decorations I’ve had since 1974 has been out of style for some time (total nonsense of course, the Styrofoam holly berries the mice have failed to nibble still have some red on them). So I find myself in the position of having to go shopping for Christmas decorations, lights, baubles, tinsel the complete trollop. Well, it turns out I’m still behind the times because those things aren’t “Christmassy” anymore. Now it’s all spray painted wicker with holly leaves stuck to it. Well it looked festive so I grabbed it, that is until I realised I was about to pay thirty quid for a collection of spray painted twigs with holly leaves stuck to them and how about £7.95 for a bag of pine cones – ‘au naturel’! Come on now! That’s when it occurred to me, “Twigs, festive leaves cones and spray paint? I have spray paint and a garden at home!” So off I flew to put my Blue Peter training into action! Naturally the first thing I went to grab was a bunch of holly leaves, but then another thought occurred to me, I have more than one holly bush. 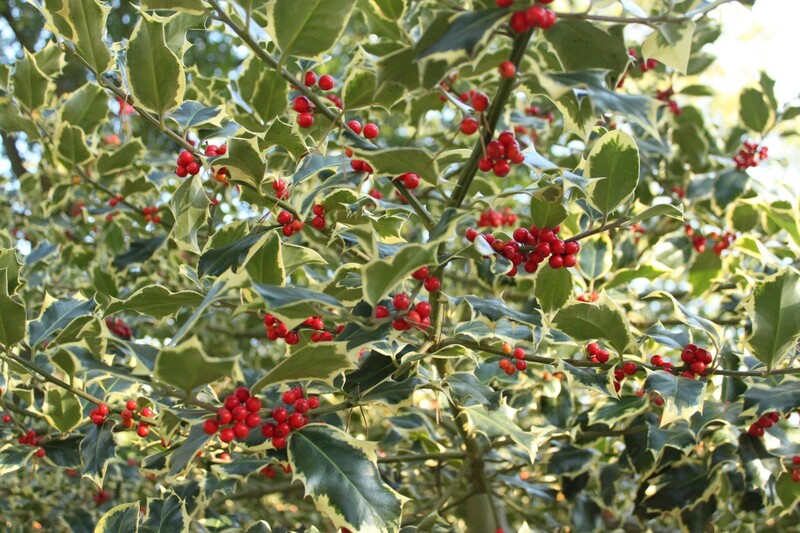 This actually opens up quite a lot of options, in this case I had some classic Ilex aquifolium the common variety with dark green spiky leaves and red berries for tradition. I remember winter walks as a child, venturing into the woods with my Dad to snip off a few berry laden branches. These were strategically placed around pictures in the lounge for some reason. In those days aerosol snow was all the fashion, so each branch was given its ration of this white compound to make it ‘more Christmassy. Goodness only knows what it did to the Environment when the branches were disposed of at the end of the season. These days, there are many varieties if you want a change. Ilex aquifolium “Argentia Marginata” for example, whose smaller leaves marked with a most attractive cream edging really stands out and creates a pleasing effect when threaded though the bannisters or turned into a centrepiece for a table or mantelpiece. 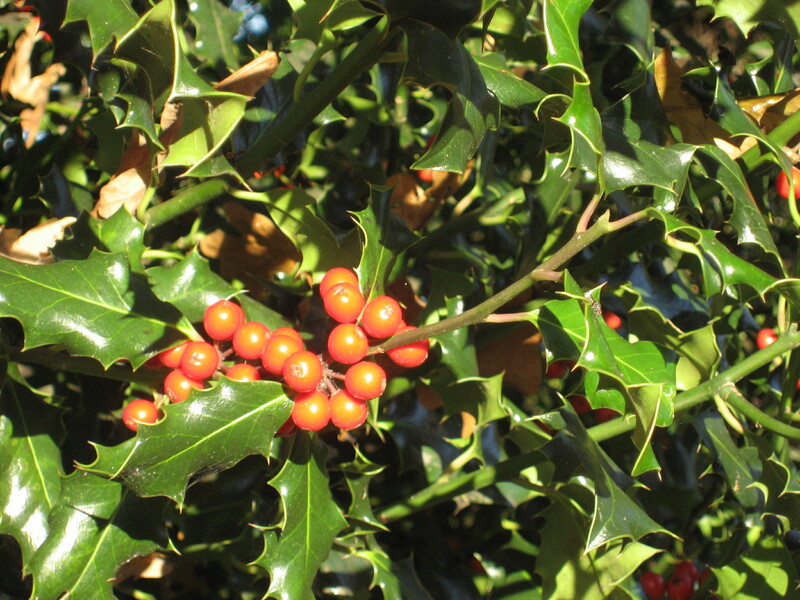 This is an attractive variety of holly to grow in the garden as well. The variegation is quite pleasing and this is one of the more successful variegated plants, creating texture and interest in perhaps a dull corner of the garden, which is what I use it for. It looks particularly good on a sunny day when the leaves really stand out. The birds find it most attractive also, so don’t plant it near where you park your car! 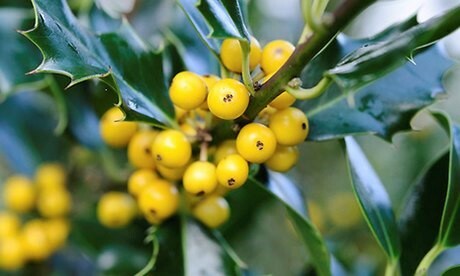 The third variety I have is Ilex aquifolium “Bacciflava” a very dark leaved holly with bright yellow berries that works very well as a table setting creating a nice change from the usual red and green (though try not to put red berries near the yellow ones, then you end up with a sort of traffic light theme). So in creating my decorations this year I resisted the temptation to pick up the old spray paint and spray everything gold and silver. Nature, as usual, is pretty good at coming up with Her own colour schemes. Another plant I brought in from the garden was some variegated ivy, initially I thought about spray painting it, but actually it looks lovely in its natural colour; dark green leaves with a pattern of light green working its way over them. I cut a few lengths of ivy from the fence and brought it in with some willow, which is a great substitute for the wire or wicker supports on shop bought decorations. Some Ivy I weaved through the bannisters on the landing with the holly, I also filled a pot with pieces of willow and twirled some ivy between them to make a sort of organic tinsel effect which worked surprisingly well. A few baubles were added for a bit of Christmas bling – splendid! My final stroke of brilliance was to bring in some of the now dying back seedheads of some teasels (Dipsacus fullonum) from the common while walking the dog. The heads themselves have dried up by now of course but once spray painted in either gold or silver, they make rather attractive and eye catching ornaments that can be applied to more willow for that cool modern decoration look or left natural and arranged in a bowl on a table. Although apparently wearing one in your lapel is considered “lame” – honestly kids have no appreciation for fashion these days. So there we have it. A house looking rather splendid for the holiday season, easy to do and a great deal cheaper than buying all your decorations from the shops. Give this a go and bring some festive cheer in from the cold.